Item #BG-PAT-1 Battlestar Galactica- Viper Patch $8.00 ea. In Stock These officially licensed Sci. Fi. Channel Battlestar Galactica Viper patched are full color, fully embroidered, patch is about 4" in diameter, patch can be sown on or ironed on, patch is a top view of a viper. Item #940 Moebius Models- Classic Battlestar Galactica MK1 Colonial Viper Ship Model Kit $29.95 ea. In Stock This new 35th. Anniversary Classic Battlestar Galactica Viper MK1 model kit is a skill level 3, comes with clear parts for cockpit and engines, in 1:32nd. scale, when assembled kit is 11 3/4" long and includes landing gear and viper pilot, extremely detailed, and clear display base, 35th. anniversary BONUS Ralph McQuarre art print, all boxes are near mint and sealed, paint & glue Not included. Item #85-6443 Revell/Monogram Battlestar Galactica-Cylon Basestar Model Kit $44.95 ea. In Stock (HAS BEEN DISCONTINUED BY REVELL/MONOGRAM) This new re-issue 30th. Anniversary edition Battlestar Galactica-Cylon Basestar model kit is still sealed, skill level 2 & updated with newly tooled detail, kit includes detailed hull survaces & bridge connections, display stand, molded in light gray & 43 pieces, when assembled is about 11 3/4" in diameter, paint & glue Not included. Item #8442-6 Larami Corp.- Classic Battlestar Galactica- L.E.M. Lander Toy $24.95 In Stock (ONLY HAVE 1) Made by Larami Corp in 1978, officially licensed, still sealed on a very fine backer card, card is 6" X 9" full color graphics, toy is about 4" long X 4" wide across the back tires, super size rolling wheels. Item #BG-GlASS-1 Battlestar Galactica- Starbuck Glass $10.95 ea. In Stock This officially licensed Sci. Fi Channel Battlestar Galactica glasses are 12 oz., brand new never before used, on the front it has a Colonial Viper with the Galactica logo under it in black, on the back is has "Starbuck" with the Battlestar Galactica BS-75 seal on the back, glass is almost 4 1/4" tall by 3 1/4" in diameter, these glasses have no chips or cracks. Item #BGAS007 Battlestar Galactica-Cylon Head Shot T-Shirt $18.00 ea. In Stock This new Battlestar Galactica Cylon Centurian t-shirt is 2 sided, with the new Cylon on the front and a small Battlestar Galactica logo on the top of the back, these Cylons are the new ones as seen on the Sci. Fi. Channels Battlestar Galactica, Cylon is in grey with his red eye in the center, all shirts come in black only and are 100% pre-shrunk cotton, shirt comes in Large & X-Large. 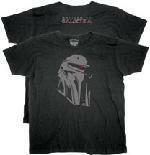 Item #BGAS003 Battlestar Galactica-Cylon Centurian T-Shirt $18.00 ea. In Stock This new Battlestar Galactica Cylon Centurian t-shirt is 2 sided, with the new Cylon on the front and a small Battlestar Galactica logo on the top of the back, these Cylons are the new ones as seen on the Sci. Fi. Channels Battlestar Galactica, Cylon is in blueish grey with his red eye in the center, all shirts come in black only and are 100% pre-shrunk cotton, shirt comes in Large & X-Large. Item #BGAS001 Battlestar Galactica Logo T-Shirt $18.00 ea. In Stock These new Battlestar Galactica logo t-shirts are from the new series seen on the Sci. Fi. channel, 100 % pre-shrunk cotton, one sided, has the BG logo in grey with the word Galactica inlined with red, comes in black only and in sizes Large & X-large, officially licensed with tags. Item #BGAS002 Battlestar Galactica Distressed Seal Logo T-Shirt $18.00 ea. In Stock These new Battlestar Galactica distressed Seal Foil Logo t-shirts are from the new series seen on the Sci. Fi. channel, 100 % pre-shrunk cotton, this foil t-shirt seal is printed in silver, comes in black only and in X-large ONLY, officially licensed with tags. 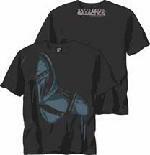 Item #BGAS004 Battlestar Galactica Viper T-Shirt $18.00 ea. In Stock This dark blue Battlestar Galactica Viper t-shirt is one sided has a top view of the viper with a circle around it and the the words Colonial Squadron, shirt is 100% pre-shrunk cotton, officially licensed, comes in X-Large ONLY.